Before she could perform her botanical mission, she was retrofitted with her great cabin converted to house the potted plants. The captain therefore had to sleep with the rest of the personnel in the crew's quarter. The fateful journey which she embarked upon was her first and her last in the newly acquired name. 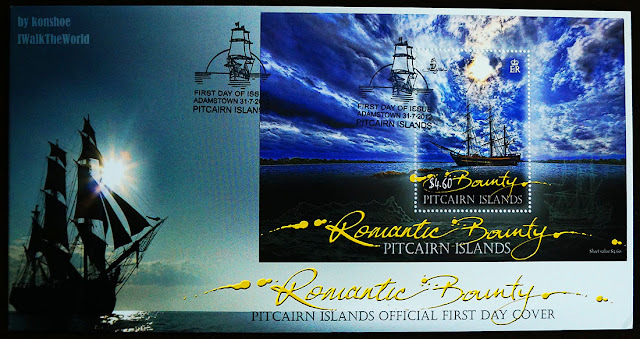 After the mutiny, Fletcher Christian sailed with some of his men to Pitcairn Island and in order to avoid detection, they burned the Bounty in the bay now known as Bounty Bay on the island. Remnants of the infamous ship was discovered in 1957 by Luis Marden of National Geographic after he spotted the remains of the rudder. He dived in the dangerous swells of the waters for a few days before managing to find the remnants. This FDC is one of my favorite. A portrayal of the Bounty against a deep blue sky captured through HDR is nothing short of awesome. There are 2 replicas built base on the Bounty. The first one was in the States being owned by, cared for and sailed by a non-profit organization. She unfortunately met her demise in the hands of Hurricane Sandy in 2012. The second Bounty is based in Hong Kong, built for the second Mutiny on the Bounty movie starring Mel Gibson and Anthony Hopkins. 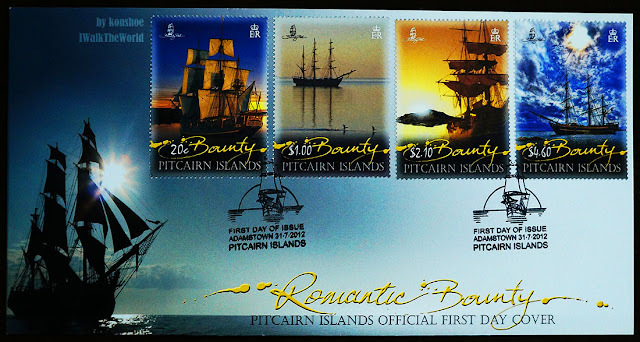 The one photographed within these stamps is the former Bounty, with these stamps immortalizing it after its destruction. The description of the issue as taken from Pitcairn Islands Philatelic Bureau is very informative on the replicas themselves. The two replicas sailing today are possibly the most-photographed of the tall ships. The USA Bounty replica was built in 1960 for MGM studios' Mutiny on the Bounty with Marlon Brando. Since then, she has starred in several feature-length films,TV shows and historical documentaries. The studios commissioned the ship to be built using the original ship's drawings from the British admiralty archives. After filming and a worldwide promotional tour, MGM berthed the ship in St. Petersburg as a permanent tourist attraction. In 1986 Ted Turner acquired the MGM film library and the Bounty with it. He donated the ship to the Fall River Chamber Foundation, which established the Tall Ship Bounty Foundation to operate the ship as an educational venture. In February of 2001 the H.M.S. Bounty was purchased from the Foundation by the HMS Bounty Organisation LLC. The second Bounty is based in Hong Kong for tourism purposes and was built in 1978/9 for the movie "Mutiny on the Bounty" starring Mel Gibson, and Anthony Hopkins at a cost of US$5M. She is a fully rigged 3-masted tall ship with an overall length of 42 metres and a displacement of 400 tonnes. The great timber masts, 35 meters in height, carry 18km of rope and she carries up to 19 sails, giving her an impressive 900 sq. meters of canvas.